Location Havurah Shir Hadash 185 N. Mountain Ave. in Ashland. Facility Our beautifully appointed classroom opens onto a spacious patio and lawn with trees, garden, play structure, and sand box. The beautiful mountains of Ashland surround us. Enrollment and Class Size Ages 3 – 5 Up to 10 children – our intimate group creates a lovely feeling of coziness while providing just enough diversity. Hours Monday,Tuesday,Wednesday,Thursday 9A.M.- 12:55 P.M.
Parent Participation Parents are invited to participate in special celebrations and to share their special talents in the classroom. We also welcome parental involvement in a myriad of ways that contribute to the building of strong community, a core value at the Gan. Your participation is the best way to model community building for the children. Director/Teacher Leah Avital Cohen is a credentialed early childhood educator with nineteen years experience teaching in diverse classroom environments at both secular and Jewish preschools. Her training includes educational kinesiology, brain gym, Montessori, and Waldorf education. She has traveled and studied abroad, lived with her family in Israel, and speaks Hebrew. Linda’s teaching experience includes eight years in the S.F. Bay Area, and she is commencing her twelfth year with Peace Garden. Introduction We are a play based, child-centered preschool, infuenced by various educational philosophies, and deeply inspired by the Waldorf approach. The program is holistic, imparting a love and respect for Mother Earth, and enriched by Jewish and universal spiritual values. The day includes indoor and outdoor creative play, arts and crafts, felting, sewing, spinning wool, singing, movement, dance, story telling, gardening, cooking, and baking. Philosophy The child -centered curriculum of Peace Garden is based on the trust that the young child, when provided with a loving and nurturing environment, will blossom as beautifully and gracefully as a fower. Each child in her uniqueness will develop in her own time…at the perfect moment. Our function as teachers is to carefully observe, listen, and gently guide the child in order to meet his needs without imposing our will upon him. With this in mind, we provide an environment that will invite the child to explore, interact, and discover the world and her relationship to it. We offer help when needed, enthusiasm for joyous endeavors, encouragement through struggles, and frm loving support through challenges. Our program is created with sensitivity, respect, and is developmentally appropriate for the young child. Young children have absorbent minds, and the spirit of Judaism will manifest through their experiences of our school community. They will learn to be stewards of Mother Earth through the garden they plant and tend, experience the miracle of nature through the harvest they reap, and share the food that they have prepared together. They will live the values that are essential to build strong community as well as a strong sense of self. At Peace Garden children are offered a safe haven to revel in the sacred place of childhood. Each day provides structure and order without rigidity. There is always room for spontaneity as it arises. Who we are Peace Garden, a Havurah program, Is operated independently by Leah Avital Cohen. We honor and welcome diversity and do not discriminate on the basis of gender, race, religion, or diverse family structure. This program is modeled on the home environment and family experience. The classroom is warm and inviting and the group size (maximum of 10 children) provides diversity while retaining intimacy. The group size allows the children to receive the attention they need and alleviates stress that can be prevalent in a larger group setting. The children become like family to one another; everyone learns to play together and inclusivity is the rule. All children and their differences are respected. Our vision is to partner with you as parents, to create caring, loving human beings who will make a difference in our world. I empower children to realize their importance as valued members of society who can, even at their young age, participate and positively influence our community. This is modeled in the classroom community through a curriculum that focuses on the importance of our relationship with each other and our connection to all living things. Children care for the environment through gardening, recycling, and generally being responsible for themselves and the way they impact mother earth. We function as a family. While each individual is valued, the focus is on the good of all. Children are naturally connected to spirit and enthusiastically respond to celebrating the magic of life. This connection manifests through the experience of taking time for reverence, expressing gratitude, and giving. We learn compassion for one another through truly listening and take care of each other. We say blessings daily to develop gratitude for all that we receive. Children learn awareness and consciousness through their experience together. Is religion part of the curriculum? Spirituality is the core of the program. The universal values embraced by most spiritual traditions, such as giving and gratitude, are imparted to the children throughout the day. There is absolutely no dogma. There is diversity and respect for all spiritual paths. If religion is not taught, how does Judaism influence the program? The values of giving and gratitude are modeled through the celebration of Jewish festivals, as is the spirit of community and reverence for nature. Holidays are celebrated in a developmentally appropriate way with a simplicity that suits children of this age. The focus is experiential with joyous participation. Is this program right for my child if we are not Jewish? Our school is inclusive and respectful of all spiritual traditions and welcomes children of all spiritual paths and backgrounds. Children who are not Jewish receive the gift of insight into another tradition. The universal teachings and values serve to enhance and support each family. How do I know if this program is the right choice for my child? No preschool or preschool teacher is perfect. However, a preschool experience can be a perfect fit for your child. ♥ Does parent/teacher communication feel relaxed? Do I resonate with the teacher’s viewpoints and values even though they may be new to me? ♥ How does the indoor/outdoor environment feel? Is it warm and inviting? ♥ Is the teacher the kind of human being that I would like my child to be influenced by? ♥ Does the teacher exhibit grounded knowledge and deep understanding of children and their developmental stages? Through years of guiding and observing young children’s development, I have come to learn first hand, as documented by the leaders in child development research, that young children are about creativity and imagination. Through their creative play they are exploring and understanding the world around them. They are working out their fears and gathering tools for life. The best possible way to serve them is to honor and respect exactly where they are and allow them to express themselves fully. The Gan is child-­‐centered, which means that my role is to stand back and allow the blossoming of the children with as little interference as possible. When the play flows naturally, I am in the role of an observer. I am there as a support and guide to help them work out the social challenges that arise so that all the children feel included and respected. The beauty of a child-­‐centered program is the empowerment the children experience through the feeling of ownership that develops as they create community each day. As a teacher with years of experience in diverse classroom size, I have created this program with specific purpose: to create an environment that mimics a large family with many siblings. While children’s true needs are always met, they do not always get what they want. They learn patience, independence, and the importance of learning to help one another. They learn to be grateful for what they have. I believe when a child’s true needs are being met, when they are receiving the attention the need and are being heard – it is their natural inclination and desire to get along peacefully rather than choosing conflict. The children receive clear boundaries and discipline is firm and loving. I provide them with the tools they need to work things out with one another. Two of my greatest passions in life are gardening and children, neither of which I truly discovered until later in life. For some reason, strange as it seems to me now, I never really contemplated their rather obvious connection! I love watching the unfolding of life in its utter magnificence, whether it is in the delicate unfolding of a fern’s frond or the unique individuality and spirit of every child. I love nurturing, guiding, and guarding them as they grow. When we are deeply passionate about our work, there is often connection between our life story and our life’s work. How many of us come to our work either because we were touched along our own paths by someone who did their job well, or because there was something missing along the path that we yearn to complete? Another deep love of mine is Judaism: the spirit, the wisdom, the culture, the tradition, and though I hate to admit it…the laws, which teach us that it is not only children who need limits! So, I suppose it was quite natural that one day I would decide to create a Waldorf inspired Jewish Preschool & Kindergarten program. The catalysts were… moving to Ashland, discovering Jewish Renewal, and meeting Rabbi David. This was finally the community that I could completely embrace and so inspired me. Here, in my new home, I was given the opportunity to blend the values that I cherish most about Judaism with the qualities of Waldorf Education that resonate so very deeply in my soul. Some may think that this combination is quite odd, but a closer look reveals many similarities. Waldorf pedagogy emphasizes the importance of educating the whole child: body, heart, mind, and spirit. These are also the four levels from which we can understand Torah, as well as the basis for the flow of prayer in our Siddur. Waldorf stresses ethical responsibility, strong community, and social awareness; the backbones of Jewish thinking. Waldorf follows the rhythm of nature and the seasons: just as our festivals celebrate and are profoundly connected to these cycles. These philosophies compliment each other on many levels. All children have the opportunity to express and experience a deep place inside themselves; a place where they are honored and respected for who they are. For the Jewish child this is also the place where their souls and the profound story of our people intersect. The children reap a sense of community that is rare today. For the child whose family is part of the Havurah Community, the potential for overlap is great and the richness that springs from it cannot be underestimated. Jewish children are able to identify with their tribal roots within a group of diverse families where cultures and spiritual paths cross and all the colors of the rainbow are honored and differences respected. All of this is imparted on an experiential level of learning with joy. We become who we are through the doing, the giving, and the nurturing of our families, our friends, our school, and our spiritual community. The circle goes round and round…with a ripple effect that embraces both Jewish and universal values. 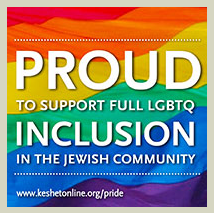 Inclusivity and honoring the vast diversity around us is a cornerstone of Jewish Renewal. I am deeply honored and grateful for my path and all that I learn from the children and our beautiful community.